The news circulated through the Tokyo Dome soon after first pitch. As reported by Kyodo News, Ichiro Suzuki had told the Mariners he would retire after the game. 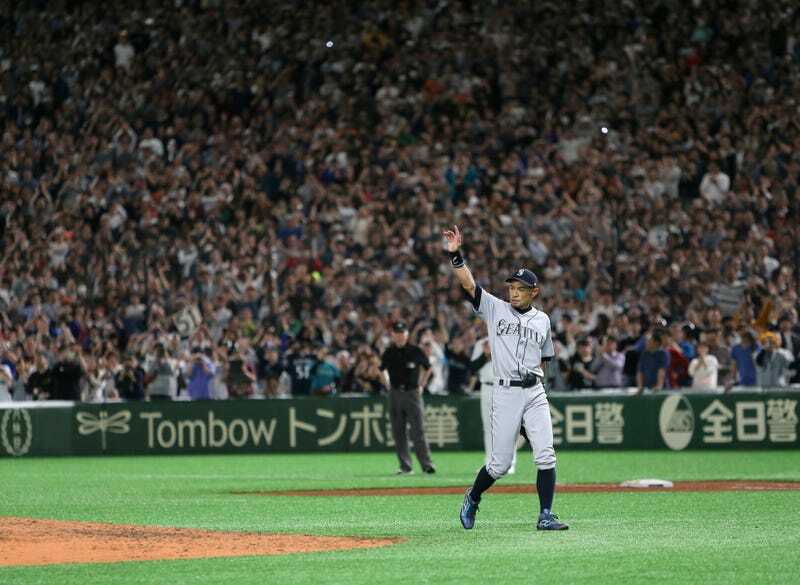 A real retirement this time; not the stepping-away of last May, when it became clear that the aged Japanese superstar didn’t have major-league stuff anymore but he wanted to hang around the Mariners—and they wanted him around—with a specific eye on this, a two-game series in Tokyo to kick off the 2019 season. Real games, games that count. With 45-year-old Ichiro, looking frailer and grayer but still slim and athletic, playing right field. Where he belongs. “I think I’ll just die,” Ichiro once joked when asked about what he’ll do when he finally hangs up the spikes. He won’t do that, because he’ll be able to stay in the game in some form or another for as long as he wants. But you know what he means: he can’t picture a life without baseball. Makes sense. It’s hard to picture baseball without Ichiro. Every MLB season since 2001, from the moment he arrived in Seattle having already become a star with seven NPB all-star seasons under his belt, there he was. Already half-out of the batter’s box, as he connected with his inimitable slap swing. Wildly rounding third as he went first-to-home on a double. In right field, making the frozen-rope throw to third that never stopped catching runners by surprise, no matter how many times they’d seen it. That, at least never, deserted him. All of which made the final game almost beside the point—this was about celebrating everything, even the stuff that may not have actually happened. It was about what Ichiro represents, from a civic icon to a national icon to the truly transpacific talent exchange he helped inspire. A baseball player’s favorite baseball player. The first and still only athlete who wasn’t on one of my teams whose jersey I bought, way back in his rookie year. What Ichiro has meant to you is intensely personal, but for us all to share. But there was a final game, and Ichiro started, and he went 0-4, in his last at-bat just failing to beat out a grounder. A hit would have been wonderful, but there are no perfect endings; if it were perfect, it wouldn’t be an ending. And so, in the bottom of the eighth, manager Scott Servais held his team back from taking the field. It was Ichiro’s field, for a moment. And then, for the 45,000 fans in the building, and the millions watching on TV there and here, and for the players in both dugouts, and for me and for you, we got to say goodbye. Baseball’s true hit king leaves a slew of legacies, and I won’t pretend to know which matter to him. But as Ichiro hugged each teammate in turn, he eventually got to Yusei Kikuchi, the 27-year-old Japanese pitcher making his MLB debut this season. Kikuchi, you see, grew up idolizing Ichiro ever since he saw him play in the first NPB game he ever attended, at age 9. “Since then I’ve read any book that there is about Mr. Ichiro, read any article about Mr. Ichiro, about his playing style, his work ethic,” Kikuchi said upon his introduction as a Mariner this winter. Yes, Yusei Kikuchi, there is an Ichiro. Cameras later caught Kikuchi sitting on the bench with tears rolling down his cheek. What does Ichiro mean to Kikuchi? Would the Mariners have so invested in Japanese scouting if not for Ichiro’s success? Would MLB teams be so eager to sign the top NPB players each winter? Would Kikuchi be here if Ichiro hadn’t done what he did? Now that’s a legacy. We’ll see Ichiro again. In Cooperstown, some summer afternoon before long, of course. But they should still let him in the Home Run Derby this year. Put Ichiro In The Home Run Derby!